There are many ways of getting close in photography. Over the last couple of weeks, I have tried to show you a few of the different ways. The above collage summarizes them. Starting from the upper left: 10x Close Up filter on a 50mm Lens photo of a flower in one of the SUNY-ESF Greenhouses, a pet hair brush taken with a Nikon 105mm f/2.8 VR Micro (Macro) lens, reverse lens macro (RLM) of a flower petal and a telephoto lens close up of a tiger at the Rosamond Gifford Zoo. This post is my “official” submission to the Close Up Photography assignment. 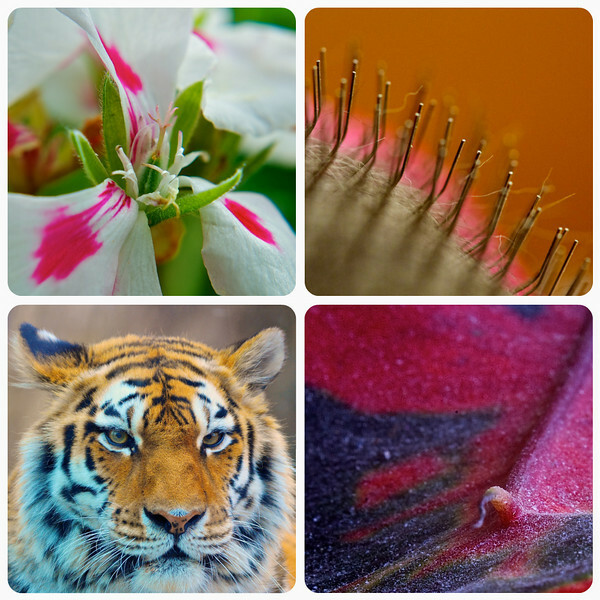 This entry was posted in Assignments and tagged 80-400mm, close up, collage, filter, flower, lens, macro, micro, new york, nikon, petal, reverse, rlm, rosamond gifford, syracuse, telephoto, tiger, vr, zoo. Bookmark the permalink. Sweet bokeh! on the second photo ( hair brush ) Love it! The photo of the hair brush I did the first night with the macro lens. I was amazed at how it blurred a very boring kitchen walls into a soft and colorful background. I used an LED flashlight to add shadows and to make focusing easier. Great mix, they look good together. I like that there are both recognizable and mysterious subjects, – like the pet hair brush photo. This was a very simple collection but I paid attention to the colors and subjects to give it a good balance. Something I’ve learned from you. Gerry, I am thrilled you noticed those corners. I did it deliberately as I thought it would give more attention to each photo. Those are great examples of close-up photography. All so different with a lot of interesting details. Thanks for this assignment, Scott. I really enjoyed it. Thank you, Isa! So glad you enjoyed it. That’s half the reason I keep doing them. Close up is a relative term. You have kept the safe distance to the cat and still managed a close up portrait. Haven’t we seen the purplish petal before? The DOF in the pet brush image gives a good effect with the light on the pin ends. Good and different. Yes, you have seen the purplish petal before but not this section nor at this magnification. I photographed the tiger using the 80-400mm VR lens at 400mm. I had to step back a bit before I could get a tight shot of his head. Sorry, you thought the deadline was later. 😦 I try to make it as clear as I can in the assignment announcements. What a great variety of subjects. Love the tiger! That’s a unique collage set-up too. The only collages I’ve been able to do so far are the ones in BigHugeLabs, and they don’t give you a ton of options. May I ask what you used to do it? Thanks, Karen. I use Picnik.com. Not sure if the free to use version lets you do collages or not. Give it a look. Great photos! Love the tiger and who knew a hairbrush could look so good in a photo. Scott, really like your close up layout, the colors compliment each other well and love the close up of the tiger.